Into a pan goes, 2 tbsp oil. Add the onions, salt, green chilly, dry red chilly. Saute well until onions turn transparent. Now add the tomatoes along with curry leaves. Once sautéed, switch off the flame. Grind the mixture well in the mixer jar without adding water. Now garnish the chutney with the above garnishing items. Wash and soak the rice, urad dal and chana dal for 5 hours. Soak the fenugreek powder. Soak the poha only 15 minutes before grinding. Grind the urad dal, poha and fenugreek into a thick batter by adding just enough water only for grinding. Grind the rice and chana dal together into a thick batter. Mix the batter well together with a ladle by adding enough salt at this stage. Let the batter rest for 4-5 hours, until the batter ferments. Once the batter ferments, add the sugar and mix well. Check the salt level also at this stage. 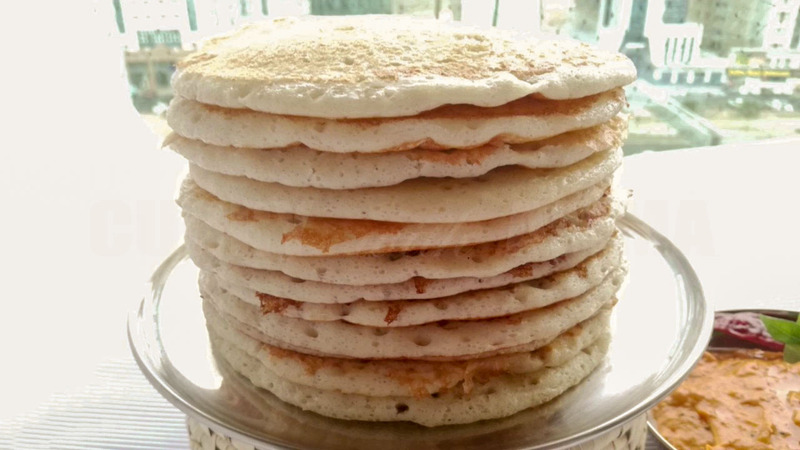 Make sure that the batter is thicker than the normal dosa batter. Never let the batter to ferment more to a sour level. More sour batter might not give desired tasty set dosa. This batter is not recommended for use on the next day. Since we have added chana dal, the batter may get over fermented. Keep a cast iron dosa tawa on stove. Once hot, grease the tawa and pour a ladle full of batter at the center and allow it to just spread with the laddle into a 4-5 inch circle. This dosa should be thick and round. Wait for the bubbles and pores to appear on the dosa. Drizzle few drops of sesame oil or ghee of your choice on the sides of dosa. Cover with a lid for 1-2 min keeping on low to medium flame. Open and flip over the dosa and let the other side also cook well. Remove the dosa from the tawa. The colour of the dosa should be golden yellow in colour. Addition of fenugreek and sugar gives the desired colour for this dosa. Enjoy the set dosa with the tomato chutney, sambar or coconut chutney of your choice !